If you are like me, I love organizational products. And if you are like me, you would like NEW organizational products. But sometimes we need to be budget conscious and use what we currently have. Fishing tackle boxes are great for craft supplies. They are lightweight and durable. Plastic dish pans are the perfect size for most standard bookshelves and can hold varieties of items (such as games or those smaller toys). Do you have an old dresser not in use? Then take the drawers and repurpose them. They often fit well under beds and stairwells to take advantage of awkward or unused storage locations. The durable plastic bags in which comforters and blankets are sold make great soft-sided storage items for anything from holiday décor to seasonal clothes. Use old jewelry boxes as draw dividers. Nail the lid of a glass jar under a wooden shelf; fill the jar with small screws, nails, etc. and screw on the lid. It’s a very visual way to see what you have neatly stored in jars. Use shower curtain hooks in your closet to hang scarfs, belts or handbags. Do you like to hold onto those plastic grocery bags and repurpose them? Well try storing them inside an empty large Kleenex box? What to do with all those spools of ribbon? Try stacking them on a paper towel holder. Do you have a stack of coloring books here and there? Try stacking them in a dish drying rack. The coloring books can be placed between the prongs like plates and use the utensil cup for markers or crayons. Use empty spice jars and place your small office supplies in them such as paper clips, tacks, erasers, etc. Are you tired of your jewelry being a tangled mess? Try hanging them on a small coat rack. It’s a great way to see all that you own. Do you have unused votive-candle holders? 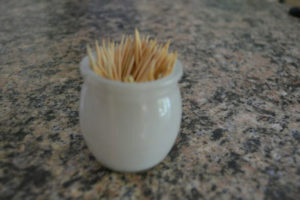 They make great storage containers for toothpicks. Do you participate in baked sales and get concerned you will lose your container that you delivered your baked goods in? Then cut the front or back panel of a large cereal box and line it with wax paper. Place your donated baked goods in it and off you go! No worries about not getting your dish returned. Having a dinner party and you need name place holders. Go for a walk in the woods and pick up some pine cones. Name card fits nicely inside and the fragrance will be delightful. Don’t just go and buy every plastic storage box or container you can find. Instead, think outside the box and bring new life to current household items. Do you have more to add to this list? Then please send in a comment and share with others.